As per reports, an explosion in Ghana’s only oil refinery caused its emergency shutdown. Explosion occurred in furnace of the Tema Oil refinery’s crude distillation unit at about 1000 hrs on 26th January 2017. It forced the management to shut down the plant in emergency. 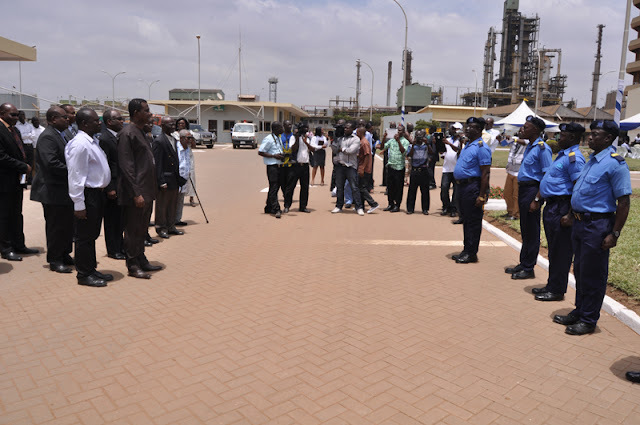 During the incident, refinery was in operation and crude oil processing was in progress. Explosion occurred in the furnace and excessive pressure and extreme heat caused the release of petroleum products. Quick response of safety and operation teams prevented the outbreak of fire. As per current reports there are no Casualties. But furnace may be totally damage and need replacement before full load operation of unit. Furnace is one of the main equipment in crude oil distillation unit. See this video for more details about how crude oil is distillated and useful products are produced. After the explosion, a technical assessment is on its way to access the damage of other machinery and equipment’s integrity. After this assessment, CDU will be operated on one furnace at capacity about 30,000 barrel per day. On a question about shortage of petroleum products after the shutdown of refinery, it is said that there will be no shortage of petroleum products as company have enough storage to cater the needs. After the incident, yet there are no words from the company officials. Even no statement is available on official website of the company. Previous managing director of the company Mr Kwame Awuah Darko has resigned and new Managing Director, Mr Isaac Osei, just assumed duties few days ago. Mr Osei have served as Chief Executive Officer of the Ghana Cocoa Board. He also acted as High commissioner in United Kingdom. Safety is one of the major concerns for oil and gas industries especially in developing and under developed countries where management is always reluctant to give safety equal weight age to production. Honest and detailed investigations of such incidents are necessary to prevent the re-occurrence and improve the systems. Role of government agencies is very important in this regard. In Ghana occupation health and safety situation needs much improvements. As study by international HSE experts has explained the current occupational health and safety legislation in Ghana and need of improvements. Currently, Factories, Offices and Shops Act 1970 (Act 328) provides the guidance for HSE practices but it is not sufficient to provide enough guideline for large and complex industries like refineries. There is much to be learned from incident to improve HSE practices in country.